This past weekend I competed alongside 5 of my teammates from the University of Delaware Powerlifting Team at the IPA National Powerlifting Championships in York, PA.
As a friend, teammate, and coach…I was blown away. It’s impossible to articulate how inspiring it was to watch each of my friends achieve their goals, break personal records, and offer unconditional support to one another throughout the entire 2-day competition. Every one of them performed with an extraordinary level of excellence which can only be attributed to their hard work, dedication, and relentless will to improve. 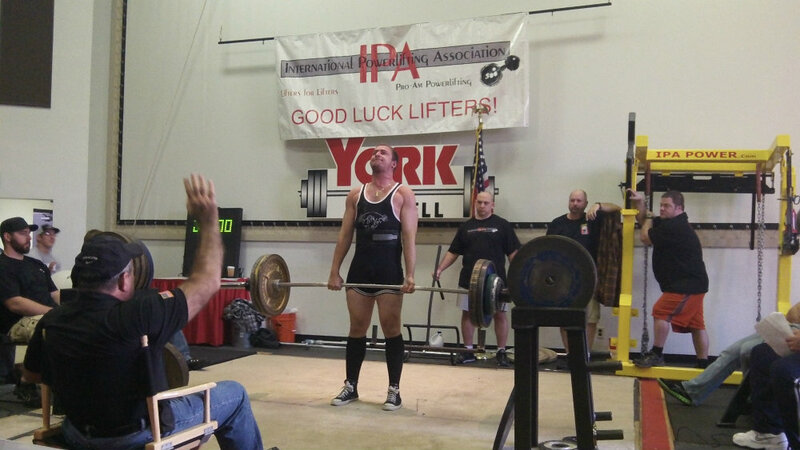 Finally, at the end of the article, I’ll recap my personal experience at the IPA National Championships, my current training-related goals, and how I plan to achieve these goals over the coming months. I met Joe over 3 years ago within the first month of my Freshman semester at The University of Delaware. Joe was wearing Converse All Stars. I was wearing Converse All Stars. Joe was Deadlifting. I was Deadlifting. 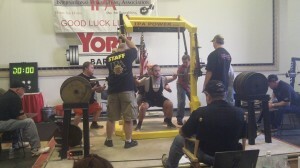 Along with two of our friends who have since graduated, Nick and Dan, together we established the UD Powerlifting Team. At the time, Joe weighed roughly 170lbs and could barely total 500lbs between his Squat, Bench Press, and Deadlift. This past weekend, after 3 years of incredibly hard work, literally hundreds of training sessions, and limitless dedication, Joe weighed 215lbs and totaled over 1,000lbs!!! Joe, you’ve been with me from the beginning and I can’t thank you enough for your hard work, encouragement, and support. It’s difficult for me to fully express how fortunate I am to have you in my life but, truth be told, I consider you my brother. Congratulations on your incredible progress as well as your recent acceptance into med school!!!! Chaz is one of the UD Powerlifting Teams’ newest members and, over the past 3 months, has made some absolutely incredible progress. When Chaz first started training with us he was already relatively strong but he had numerous postural asymmetries and needed a great deal of work to correct his form and technique in the Squat, Bench Press, and Deadlift respectively. Congratulations, Chaz!!! I’m so glad you decided to join the Powerlifting Team and couldn’t be more impressed with your desire to train and willingness to learn. I look forward to working with you and seeing your continued success. And good luck with your NASM certification exam – I know you’re going to ace it! Since joining the team nearly 1 year ago, this past weekend marked Sean’s first time competing in a sanctioned Powerlifting competition. Even after missing several weeks of training due to severe food poisoning and walking pneumonia only one month ago, Sean was enthusiastic and ready to lift. While he was disappointed with his overall performance, I couldn’t be more impressed with his effort and determination. Despite having trouble with his Squat and Bench Press, after a long day of lifting Sean set a new Pennsylvania State Record and hit a 10lb PR Deadlift of 510lbs at a body weight of 181lbs, (over 2.8x his bodyweight). Congratulations, Sean! You work harder than anyone I know and I’m excited to see your continued progress over the coming semester. Thank you for helping me to become a better coach, training partner, friend, and, of course, all of your help coaching the team; I appreciate it more than you could possibly imagine. 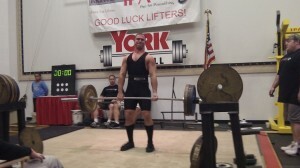 Ryan is another new member of the UD Powerlifting Team and we’re extremely privileged to have him. I sat next to Ryan in an Intro to Strength and Conditioning class during our most recent spring semester but neither of us spoke very much. Lo and behold, several months later Ryan recognized me in this YouTube video from Westside Barbell and we immediately began to discuss the possibility of him joining the team. As a previous collegiate football player, Ryan is one of the most explosive individuals I’ve ever met. Not only is he a gifted athlete, but he’s also working extremely hard to become a more knowledgeable and influential coach; keep your eyes peeled for him in the S&C world because there’s no doubt that he’s going to make a name for himself. Congratulations, Ryan!!! You’ve been a huge asset to the team and you’re making incredible strides both physically and mentally. I’m very excited to see your continued success over the coming year. Kev’s been lifting with the UD Powerlifting Team for nearly 6 months and has improved more quickly than I ever imagined possible. As a previous football player and heavyweight wrestler, Kev came to the team with several pre-existing injuries including knee surgery and lower back pain. More or less starting from scratch, Kev needed a complete form and technique overhaul for his Squat, Bench Press, and Deadlift; not to mention, his lack of mobility wouldn’t allow him to assume the appropriate positions to begin with. As such, working with Kev has been somewhat of a slower process but, as a result of his patience and desire to improve, he’s made truly incredible strides. Congratulations, Kev – I’m so happy for you!!! You’ve dedicated an extraordinary amount of time, effort, and patience over the last 6 months and your incredible performance this past weekend is a testament to it all. I’m excited to train with you and help you prepare for our next competition – I know you’re going to blow these most recent personal records out of the water. Notably, the 415lb Squat is a new IPA World Record and the 420lb Deadlift is a 5lb personal record, both of which have been long-term goals that I am very excited to achieve. I attempted a new IPA World Record Deadlift of 435lbs but rushed the lift and couldn’t get it past my knees – the next time I compete I’ll definitively break this record. Needless to say, my Bench Press needs the most work. I tried jumping from 235lbs – 250lbs (which I’ve hit before) but I just wasn’t in my groove. After reviewing the videos, as well as my previous training routine, I know to improve my bench I’ll need to incorporate more heavy board presses for lockout strength as well as more direct shirted bench training for skill development. 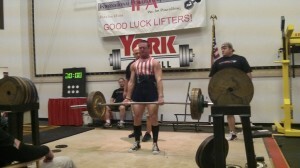 By the next time I compete I plan to hit a 265lb Bench Press. From January 4th – March 11th I’ll focus on gaining strength with an emphasis on increasing muscle hypertrophy (i.e. mass gain). Throughout this time span I’ll progressively incorporate more jumping & plyometric based movements to improve power and rate of force development (RFD). As for the UD Powerlifting team, over the course of this week I’ll be sitting down with each team member to discuss their individual goals and weak points. In doing so, we’ll be able to simplify the training process and, most importantly, create individualized programs based on each lifter’s specific needs. I’d like to thank the UD Powerlifting Team, and my family, friends, and colleagues. With Thanksgiving right around the corner it’s important for each of you to know how extraordinarily thankful I am to have you in my life and how much I appreciate your friendship and support. Thank you so, so, so much and have a fantastic (and delicious) Thanksgiving break!